Efficient water use is a priority for the District. Intelligent water management requires that we know exactly how the irrigation canals and adjacent sloughs behave. Questions such as how much water is lost in each canal through seepage and "spill" and how much water is returned to the delivery system from farm fields need to be answered. Water flow measurements will be taken to gather data that will answer these and other questions. 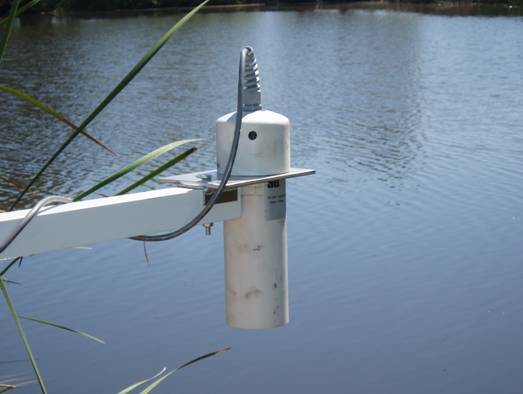 YCFCWCD is installing a system of automated sensors to obtain and transmit data. This network, which is funded in part by a grant from Proposition 50, will consist of ultra-sonic sensors that are powered by their own solar panel, and will convey the data by wireless communication technology. The information gathered will allow the District deliver water with maximum efficiency. Housing with an ultrasonic sensor. Ultra sonic sensors bounce sound waves off the water surface, then measures the time for the sound waves to return to the sensor. Using the speed of sound as a constant, the water depth is calculated automatically. 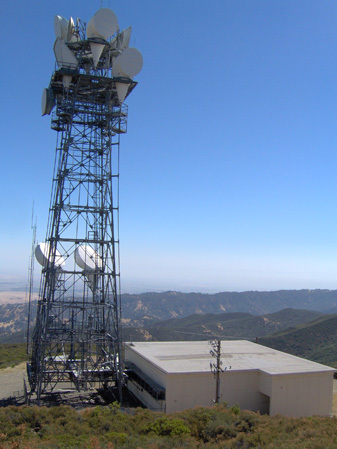 Berryessa Peak: this wireless radio relay station, is to communicate with remote flow monitoring sites. In the future, the District is planning on adding additional sensors to gather data on water quality. Factors such as temperature, EC (electrical conductivity), and turbidity indicate how healthy water is for fish and other wildlife.